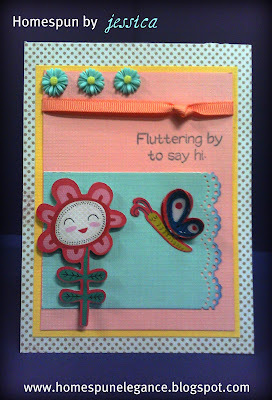 A sentiment stamp From Robyn At My Pink Stamper and a punch from Fiskars. I also used my Zip dry glue on the layer for the butterflies wing. It gives it a shiny gloss. Hello Jess, What a great card, so cute. Love the sentiment, goes so well with your cricut cuts. Love the Spring feeling from this card especially the HAPPY flower! Super cute card! I am loving that happy flower! 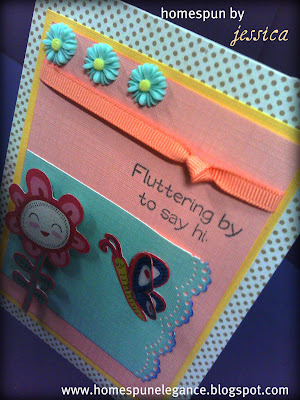 Love your spring card, the flower is adorable and the MPS stamp goes great with your card! LOVE this card! The butterfly is too adorable! Your card is so cute and cheerful!! Very cute, I just love your new blog, it's so pretty!! Thank you MelisCreations! It really means a lot to me to hear that! I hope that you will come back! I am hosting a blog hop this Saturday and Sunday with some very talented friends! Hope you will stop by! !